Black Milk Cereal Dive is open for business. If breakfast is your favourite meal of the day, Black Milk Cereal Dive is for you. 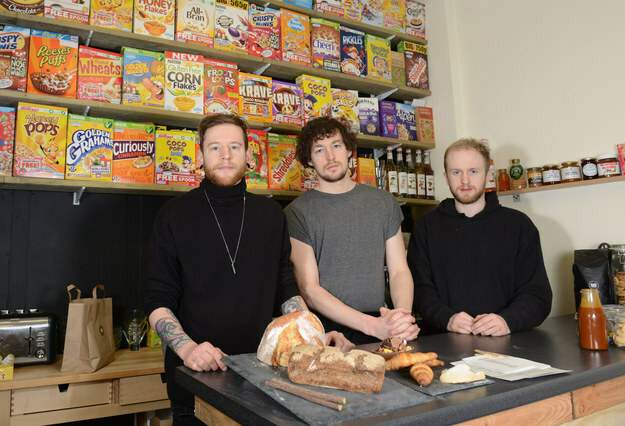 Oliver Taylor (centre, pictured with his business partners Luke and Andy), originally from Chorlton, came up with the concept. He tells BuzzFeed Life “we were inspired by Momofuku in New York and originally just wanted to open a milk bar. When we were brainstorming ideas, cereal and milk were so closely linked that we decided to merge the two”. 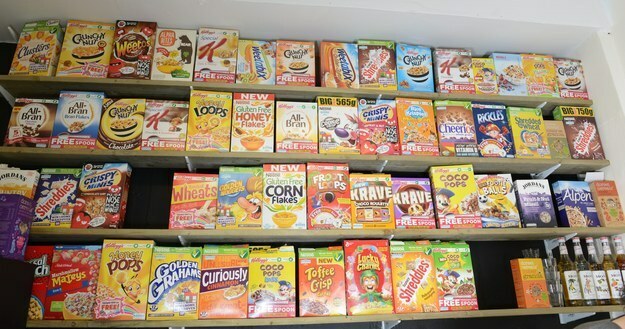 The café has a wide selection of cereals. You can choose from around 50 different cereals, and Lucky Charms are currently the customer favourite. Although there are lots of Kellogg’s and Nestle cereals, the team try to incorporate a few boxes from independent retailers too. And there are seasonal specials too. 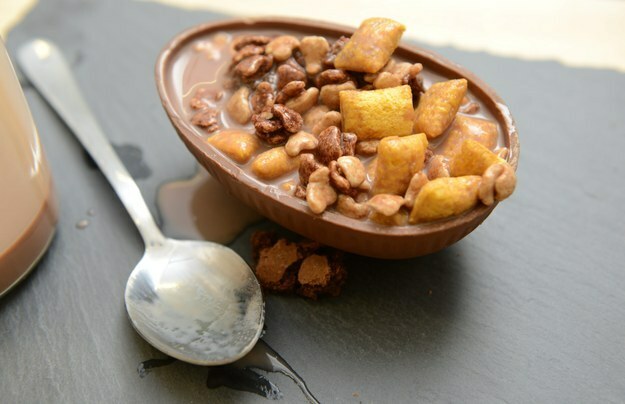 This is the Easter Feast: a special Easter creation with chocolate milk, mini eggs, Krave Roulette, Lion bar cereal and freshly baked brownies, all held in half an Easter egg. Black Milk Cereal Dive only opened on Tuesday but they’re already taking bookings for the weekend. This place is going to be so popular that you can’t just wander in for a hungover bowl of Lucky Charms on the weekend. Usually you can just drop in, but on Saturday 7th March, it’s best to make a booking to avoid disappointment. The milk in your cereal can be infused with a range of flavours, from salted caramel to squid ink (hence the name Black Milk). The new Dive. @blackmilkcereal. 2nd Floor Afflecks Palace (Oldham St Entrance) #cereals #cakes #cookies #trovebakery #bread & pastries #mcallsorganics #fruit & #coffee Catch us in here all day. 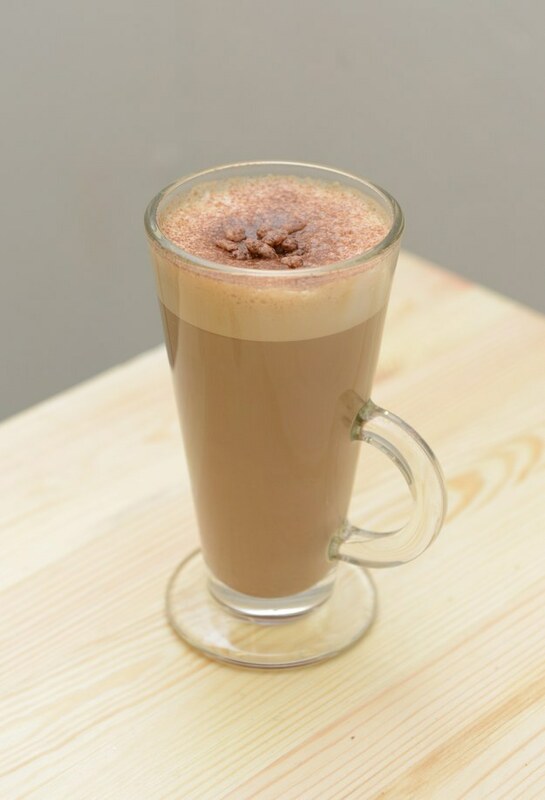 The milks are also used in drinks, like this Coco Pops Cappucino. Oliver says “we offer a full breakfast experience with some naughty treats. 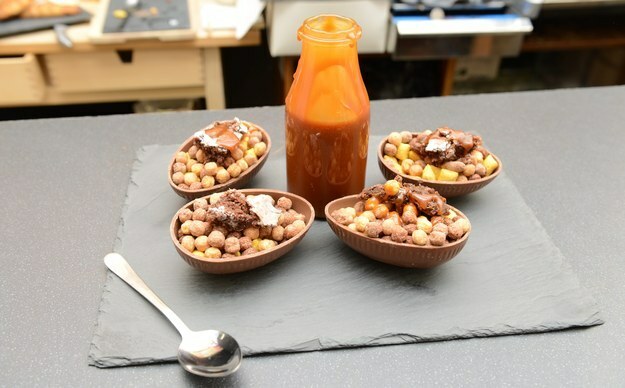 We’ve got over 20 different toppings and the same number of infused milks that we use for the cereal and to create drinks, like the coco pops cappuccino”. If you can’t pick just one cereal, try a slider. A cereal slider is a long wooden board with three or more types of cereal, in separate small glass bowls. Becky (pictured) and the other Black Milk customers we chatted to were looking forward to coming back. When we visited on a Thursday morning, it was mainly groups of friends having late breakfasts. 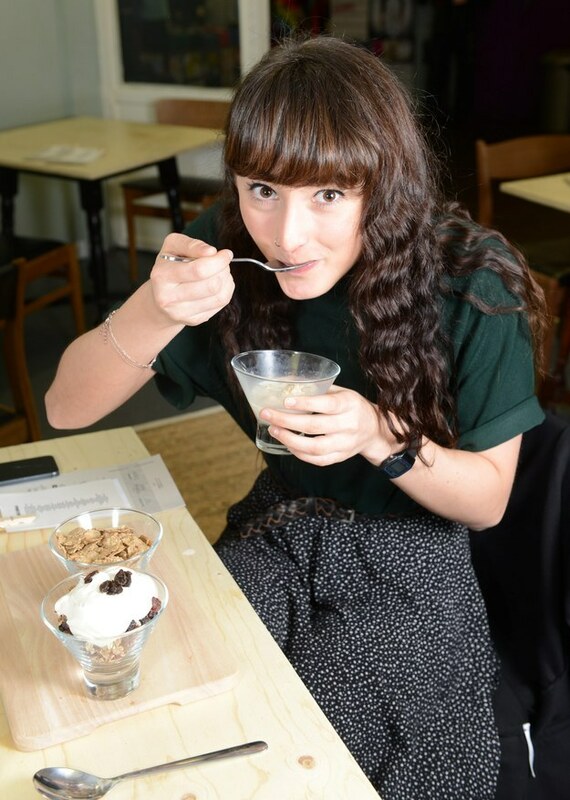 A customer called Amelia told BuzzFeed “we wanted to visit the cereal café in London, but since there’s one here we thought we’d pop in for breakfast. The prices are pretty cheap too”. You can also enjoy all sorts of handmade and locally sourced goodies. With my haaands in tha cookie jarrr.. The atmosphere in the café is pretty laid back and friendly. 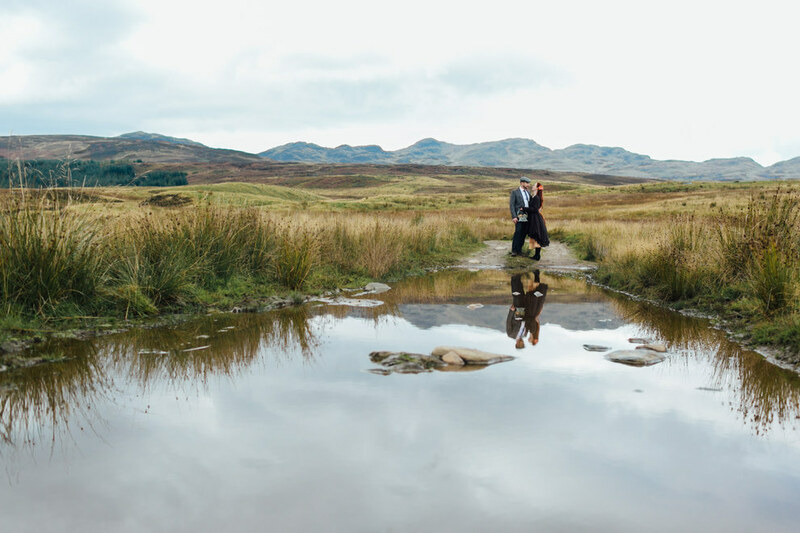 The owners and staff are always willing to sit down for a chat, and want to appeal to a wide range of customers. They’re not just interested in attracting cereal enthusiasts. Oliver and the team want to see everyone enjoying cereal, homemade cakes and three bean roast coffee. You can find Black Milk Cereal Dive on the second floor of Afflecks Palace, 52 Church Street, Manchester. You can also follow them on Facebook and Twitter. Happy munching!